In this demonstration project, wastewater is delivered into infiltration basins. Viruses and other pathogens are removed as effluent percolates through sandy earth into the ground water. Extraction wells then collect and discharge the infiltrated water, along with a small amount of native groundwater, into a disinfection system. Because of the demonstration nature of the project, the design criteria selected by the engineer emphasized economical components with their potential for integration into a future full-scale facility, or ease of removal and recovery. Two of the key components of the RIX project are its chlorine contact tanks. The project includes two unique S-shaped tanks constructed of standard modular components. The use of these modular tanks met requirements for cost effectiveness and ease of construction. The installation also emphasizes the growing role of modular design in tank systems for liquid containment and handling. The solution was supplied by ModuTank, Inc., Long Island City, NY, a manufacturer of modular, bolt-together tanks equipped with fitted flexible membrane liners. The tanks were assembled at the site from galvanized steel panels. As cost-effective answers to an unusual specification, ModuTanks were regarded as “ideal” for this one-year phase of the demonstration project, and will be dismantled at the project’s conclusion. Due to differing soil conditions, two separate demonstrations are being performed on the same site. 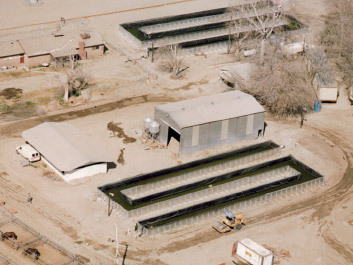 One-million gallons of undisinfected secondary effluent is piped from the Colton and San Bernadino treatment plants to the site from distances of 1.5 to 7.5 miles, respectively. Water quality is monitored at entry to the tanks and after a final chlorination step to assure it meets all discharge standards set by State and local regulatory agencies. Following disinfection, the water is discharged into the Santa Ana River, where it is required to meet the state’s quality criteria for recreational use.